River Run Manor is a 16,000 sq. 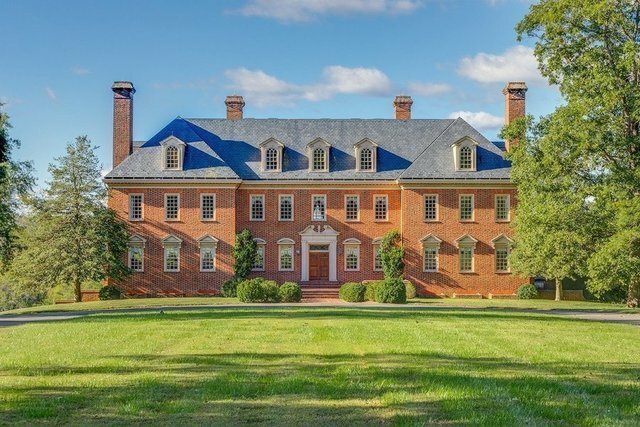 ft. Georgian Revival mansion on 61 acres sitting high on a bluff overlooking the James River. The home was built from 1981-1987 by Taylor & Parrish using only the finest materials and superior craftsmanship. The interior displays luxurious details, including marble floors, ornamental cornices, plaster friezes, 18 foot columns with gilded Corinthian capitals and crystal chandeliers. On the main level, incredible grand foyer with twin staircases and portico, grand ballroom leading to blue stone terrace, thoughtfully and intricately designed formal living and dining rooms, breakfast/florida room, and office with arched bookcases and paneling. 8 private bedrooms, lower level game/rec room with wine cellar, 3rd floor apartment with full kitchen, 4 car garage and so much more. From the upper terrace, one can view the gardens and the river below and access the lower terrace from the double curved staircases. A pool house with hexagonal raised dome sits in front of an oval pool with blue stone terraces and limestone balustrades and a tennis court/pavilion completes this magnificent estate! River Run will be shown by appointment only.